SAN ANTONIO, TX — San Antonio Spurs sharp shooting point guard, Danny Green, will join the Spartan Shooting Boot Camp on June 9-13, 2014, located at Castle Hills Baptist School in San Antonio, Texas. The camp is open to to all boys and girls of all skill levels from 3rd to 12th grade and will run from 9:00 a.m. to 4:00 p.m. each day. Green also joined the Spartan Basketball Spring Break Camp that was held on March 11 – 15, 2013. 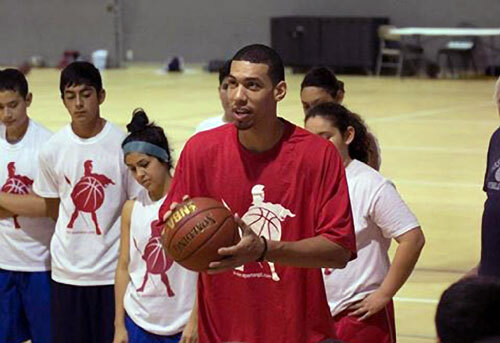 Photo shows San Antonio Spurs star shooting guard, Danny Green, at the Spartan Basketball Spring Break Camp that was held on March 11-15, 2013. The Spartan Basketball philosophy was founded on the heroic morals that promote perseverance, integrity and discipline. While in the middle of basic training to become an infantryman for the Army National Guard, Coach Tim Springer developed the program structure and principals of Spartan Basketball. It was designed as a lifestyle philosophy that carries over seamlessly into how basketball training is approached. Watch the following video where coach Tim Springer of Spartan Basketball and Danny Green break down a drill that uses both cross screens and down screens to get a shot. The coaching staff at Spartan Basketball believe that the best motivation to give is self motivation. This is achieved through training in setting and meeting goals, team vision and knowledge of self. At the camp the drills are structured for high repetitions, maximizing the campers opportunity to master the process of shooting. The camp also provides campers with a comprehensive knowledge of the game so they can understand where to shoot, teaches them separation moves to create shots, and allows them to review NBA game film to study and learn from the best shooters in the game, like Danny Green. Danny Green is a star shooting guard / small forward who currently plays for the San Antonio Spurs. If you would like to book basketball speakers or NBA stars like Danny Green for a speaking engagement, autograph signing, basketball camp, guest appearance, V.I.P. meet & greet, product endorsement, charity fundraiser or special event, contact Danny Green’s booking agent for appearance and speaker fees at Sports Speakers 360.